Just in the past decade, UGG boots have gone from being a mere fashion fad to becoming an essential winter wardrobe staple. We’ve even seen celebrities wearing them with leggings and jeans. If you are one of the legions of people who practically live in their UGG boots, then chances are, they’ve gotten quite mucky and dirty from being overused. Luckily, it’s very easy to clean your boots at home. Here at Your Next Shoes, we’re going to show you how to bring your UGG boots back to their immaculate state, whether they’re just slightly scuffed or totally dirtied up. 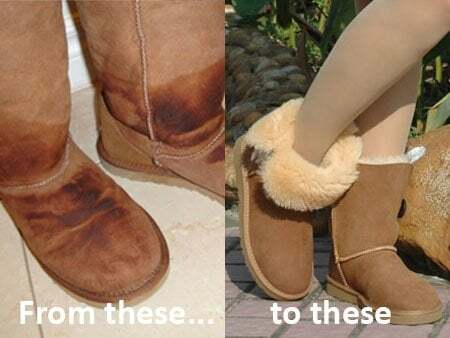 Here are the steps on how to clean your UGG boots and restore their brand new, fresh-out-of-the-store glow. Using a soft-bristle brush, brush away any loose dirt on the boots. Brush only in one direction to remove the scuff marks. If there are stubborn stains, you may use fine sandpaper or a nail brush to brush the boot’s surface. A spot eraser will also work on stains, especially for wax-based, oil-based, and old stains. Fill the washing machine with cold water only. Hot water will shrink UGGs and weaken the adhesives. Use only a non-enzyme liquid detergent designed for leather. You may use a mild wool detergent or sheepskin-specific shampoo. Put your washing machine on the gentlest cycle possible. Wash only for a few minutes. You may run them through the spin cycle just to get the excess water out. DO NOT put your UGGs in the dryer (refer to the Before Drying and After Drying portions of this article on how to properly dry wet UGG boots). Do NOT wash UGGs with other clothes. If you for some reason have no other choice, wash only with colors similar to your UGGs. Make a solution consisting of one part cold water and one part leather cleaner and conditioner. Apply solution onto damp cloth or sponge. DO NOT place solution directly onto the boot. Using small circular motions, gently scrub the solution onto the surface of your UGGs. Do not rub or submerge your UGGs in the solution. For areas that are stained or are dirtier, you may dab on more of the solution. Be careful not to soak them through. Rinse with a new, clean sponge. You may also choose to wet the entire boot (still do not soak) to prevent water lines from forming while drying. Get as much water out of the boots. Hang them upside down on a boot stand to dry. If a boot stand is not available, stuff them with paper towels, a roll-up towel, blank newsprint paper or cardboard. Doing so will return the UGG boots back to its original shape. Place the UGG boots in the shade, away from direct heat. Direct heat will damage the boots, shrink them, and fade the color. Never use a hairdryer or a tumble dryer to dry UGGs. Leave to dry for 24 hours or more. Make sure that they have dried completely before storage to prevent mildew from growing. Once your UGG boots are dry, use a suede brush or any similar brush on its surface to restore the nap on the boots. Follow the suede’s natural line when brushing. Deodorize your UGG boots. You can use a simple mixture of 2 teaspoons of baking soda and 2 teaspoons of corn flour. Powder the inside of your UGGs with this mixture and shake off the excess. Respray your UGG boots with a water resistant and stain repellent spray. Coat the surface with the spray evenly until the boots appear wet. After deodorizing and spraying, let your UGGs stand overnight. UGG boots should be treated right after purchase. If you plan on buying a new pair of UGGs, purchasing the protective spray along with it is worth it. This will lengthen the life of your UGGs and you’ll be able to get more wear out of them. Avoid wearing UGGs on rainy days and on days when the snow is wet and slushy. It’s best to wear a different pair of shoes when going hiking, trekking, or a long walk – wearing your UGGs while doing these activities can get them smudged and stained. To lessen the time it takes to clean your UGGs, consider buying the replacement insoles. That way, if the only the soles get dirty, you only have to take them out and toss them in the washing machine. Your UGG boots may shrink somewhat after cleaning. Don’t worry, they’ll stretch right out after you wear them again. Also, if the sheepskin appears to have turned a different color, wait until they dry out completely. This is the material’s natural reaction to water and they should return to their original color once dried. Don’t miss this excellent video showing how you can clean your UGGs using the care kit!